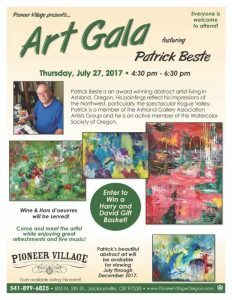 Pioneer Village presents an Art Gala featuring Patrick Beste on Thursday, July 27, 2017, from 4:30 pm to 6:30 pm. Everyone is welcome to attend. Patrick Beste is an award-winning abstract artist living in Ashland, Oregon. His paintings reflect his impressions of the Northwest, particularly the spectacular Rogue Valley. Patrick is a member of the Ashland Gallery Association Artists Group and he is an active member of the Watercolor Society of Oregon. Come and meet the artist while enjoying great refreshments and live music! Wine and hors d’oeuvres will be served. Also, enter to win a Harry and David gift basket. Patrick’s beautiful abstract art will be available for viewing from July through December of 2017. For more information, please contact Dennis Crossman: dcrossman@pioneervillageoregon.com /541-899-6825.